One of the commitments of CIS Wealth Management Group has been to make investment recommendations to each client which reflects their specific long term financial goals, investment temperament, allowance for market volatility, and risk tolerance. This means each client’s portfolio is tailored specifically to them, and will look dissimilar from their friend or neighbor’s who has a different set of financial goals, investment temperament, and tolerance for market volatility and risk. It also means that returns from a personal portfolio will look different from the returns of a stock index like the Dow Jones, S&P 500, or NASDAQ. Depending on your personal long term financial goals, investment temperament, ability to handle market volatility, and risk tolerance we make sure to put you in a portfolio that matches you, not a stock index. Stock indexes can rise and fall much more dramatically than a diversified portfolio of stocks, bonds and alternatives. Our strategic portfolios include a wide range of value and growth stocks consisting of small, midsize and large companies across many industry sectors and countries for the greatest diversification. 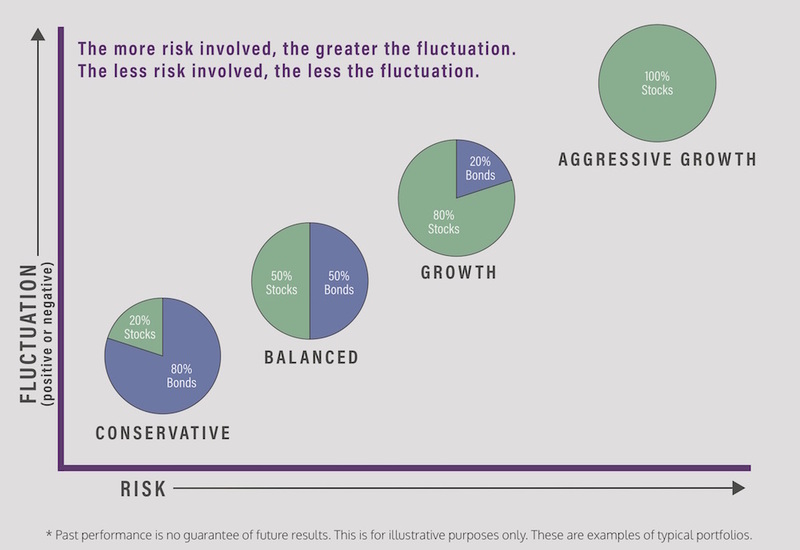 The proportion of stocks we put someone in depends on their personal risk tolerance and fall into four different risk models. These models are conservative, balanced, growth, and aggressive growth. Typically 100% allocated to stocks. Benchmark average return goal is similar to that of a diversified portfolio of many different stock indexes. Typically 80% allocated to stocks, 20% to fixed income and alternatives. Benchmark average return goal is similar to that of a diversified portfolio of 80% stock indexes and 20% bond indexes. Typically 50-60% allocated to stocks, 40-50% to fixed income and alternatives. Benchmark average return goal is similar to a diversified portfolio of 50-60% of stock indexes and 40-50% of bond indexes. Typically 20-30% allocated to large cap value stocks, 70-80% to fixed income and alternatives. Benchmark average return goal is similar to a diversified portfolio of 20-30% of the large cap value stock indexes and 70-80% of the bond indexes. Let’s say this Balanced Portfolio is 50% stocks, 50% bonds. If the stocks make a 9% return, the portfolio realizes a 4.5% return, or half of the return, since only half of the portfolio is invested in stocks. If the bonds make a 3% return, the portfolio realizes a 1.5% return, or half of the return, since only half of the portfolio is invested in bonds. The total portfolio return is 6% (4.5% from the stock portion plus 1.5% from the bond portion). What about in a down stock market? If the bonds portion still makes a 3% return, the overall portfolio realizes a 1.5% return, or half of the return, since only half of the portfolio is invested in bonds. The total portfolio decline is just 3% compared to a stock market decline of 9% (4.5% loss from the stock portion, 1.5% gain from the bond portion). In order to have a true comparison that yields legitimate results, the items compared need to be exactly alike. Comparing the returns of a diversified conservative, balanced, or growth portfolio which are not entirely made up of stocks, to the returns of the Dow Jones, S&P 500, or NASDAQ, which are indexes entirely made up of stocks, is like comparing apples to bananas. It is not an accurate comparison as they are extremely different. 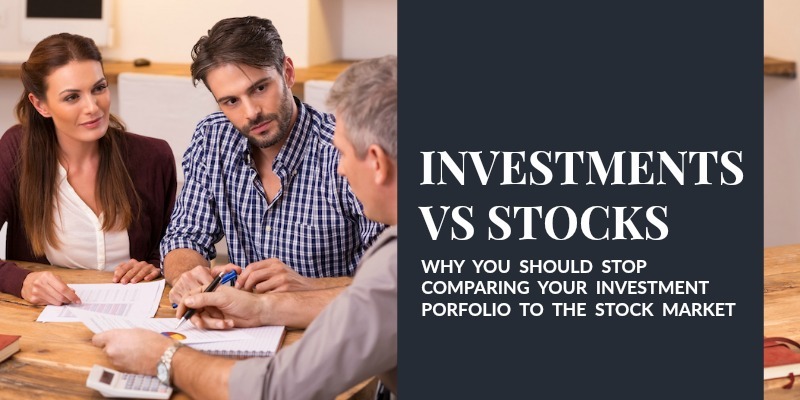 An expectation to make the same returns of an aggressive portfolio if one has a balanced or conservative portfolio, is also not accurate, since the amount of risk taken is different for each portfolio. Greater risk should equal greater reward. If one is taking less risk they should not expect the same return as one taking more risk. Otherwise, why would anybody ever take more risk if they are not rewarded more for doing so? We are here to continue to serve our clients and help them pursue their personal financial goals. If you have any questions about your risk tolerance and how to correctly compare your particular portfolio to the index benchmarks, feel free to call the office at 830-609-6986. * Investors cannot invest directly in indexes. The performance of any index is not indicative of the performance of any investment and does not take into account the effects of inflation and the fees and expenses associated with investing.